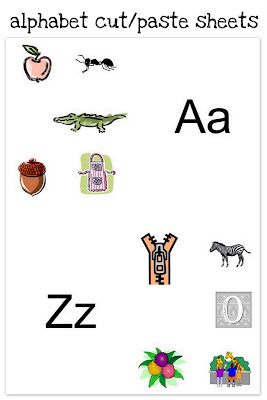 Each week along with our letter-of-the-week learning I've been posting the cut and paste worksheets that we do for each letter of the alphabet. To make it easier, I've put the whole lot of them into one big ol' PDF file so it's handy in one place. 'Cause I'm nice like that. Here's the entire document and you'll also find it linked in the left sidebar under "Preschool Printables". Just click on the thumbnail graphic to print it off! Feel free to print them off, and if you'd like to link back to this page, that's fine too. Thank you, thank you! Love linking back to you, you give so much of your own time to help out others like myself:-)! These are such fun! I hope to incorporate these into my program with my preschooler. Thank you kindly! These sheets look great! Thanks so much! Thanks also for sharing about revamping your homeschooling schedule...we have been doing that, too, and it is reassuring to hear that others are in the process of tweaking their routines as well. Thanks so much... these are wonderful! Just curious... I was unable to print a picture sheet for the letter Y... did I miss it somewhere? williams@usa.com. Thanks! Thank you so much for this amazing blog and printables. I can't wait to use these with my daughter. I printed out the alphabet cards and noticed there was no picture sheet for Y. (It was blank.) Did I somehow miss it? Thank you again so much! My printer is in overdrive right now! It might go well with your letter of the week learning. Let me know what you think.